It was while watching a SCI FI Ancient Aliens show I first heard about the underground cities of Derinkuyu, Kaymakli and Ozkonak. 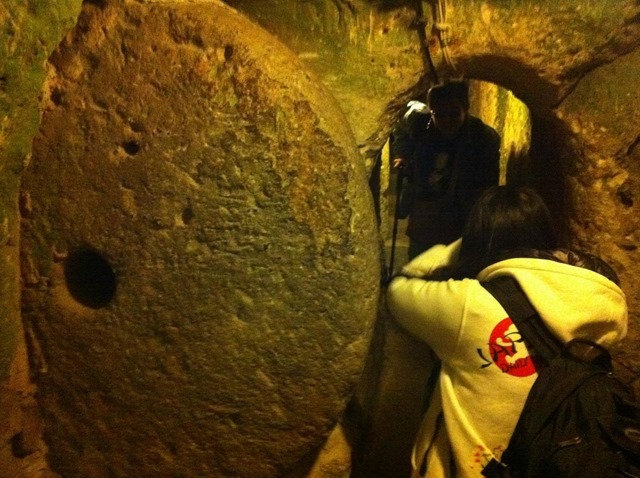 These and the other 200+ Underground Cities are a huge mystery that may never come to full light. Everything we know is just from what has been found in excavating what remained. This could be remnants from those who were last there, as these caves could be much much older. There really are so many cave systems and underground tunnels and essentially full cities underground that it may never be fully excavated. These cities contained wineries, stables, churches, school, cellars, storage rooms. 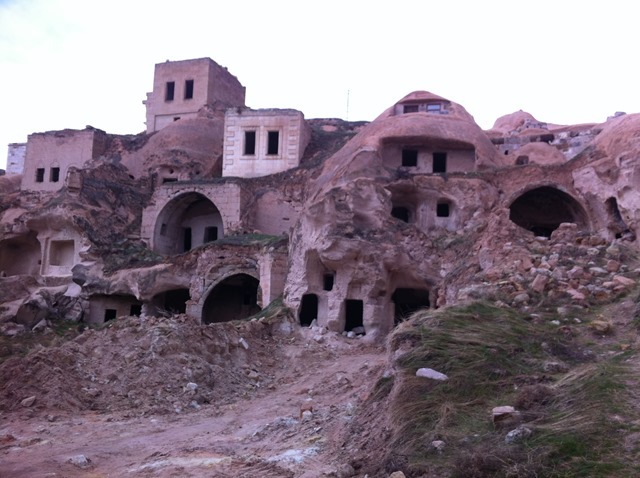 The largest of the underground city of the in the Derinkuyu district in Nevşehir Province, Turkey. It’s only been open to visitors since 1969 and less than half of what has been excavated is accessible to tourists. At peak this city could have supported 20,000 residents and was up to 85 Meters deep!!! According to the Turkish department of culture the cave is 8th to 7th century possibly built by the Phrygians either for religious purposes or refuge. Now if you’re looking to visit this region, Goreme, Turkey is a great central location and really setup well for tourists where you can sleep in your own cave, but not part of any major tunnel system. 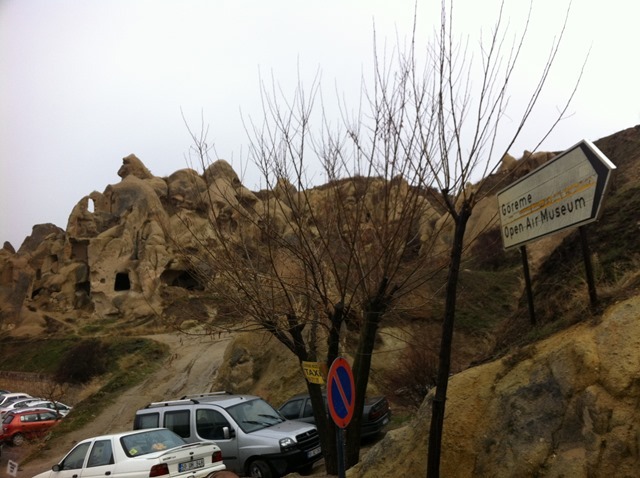 Goreme has shuttles to and from the airport. Warning: If you are planning on not renting a car (which you shouldn’t need to do), you need to make sure you arrange ahead of time with one of the shuttle companies, the small airport in Kayceri has no ticket desk for shuttles and the taxi ride is pretty steep comparatively. I was denied entry into a shuttle bus even after offering to pay him his price. The driver won’t take money, it has to be pre-arranged. I ended up catching a ride with an older couple that was headed into the city. Really I got lucky, I didn’t want to pay the high price of the taxi, and there were no bus options that were convenient. It was going to be a long walk and an inconvenient trek to the bus station, and who knows how long I may have had to wait. WIth as many tourist shops and vehicles as there are in Goreme it was amazing to me how there was really NOTHING at the airport. On the surface you really wouldn’t even know it was down there, save the entrance sign and a few air vents that look like wells. Based on the size of the 500KG door that’s only able to be opened from the inside, I can definitely imagine it being used for refuge and for hiding from someone or something. There are some spaces that are very wide open such is just outside the church which makes the shape of a cross, underground, or the very tight spaces that is speculated as being a doorway that forces the person to be penitent. They must go onto their knees to enter. The self inflicted punishment is they would go around and around through the small tunnel to learn humility, kind of like the hail Mary or doing rosary beads. When inside unless you’re claustrophobic, you feel very safe. The walls seem very solid and there isn’t any crumbling rock. There are some areas where you need to bend over to avoid hitting your head, but the hall near the church has a lot of room, and supports really large gathering of people. 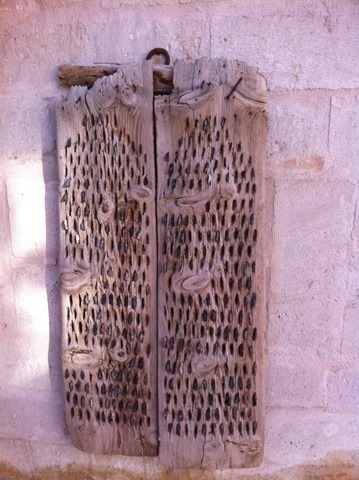 Look closely at these boards and you have one of the primary tools used to carve the stone with much sharper stones. The would drag the board across the softer stone and it would essentially carve away the stone. 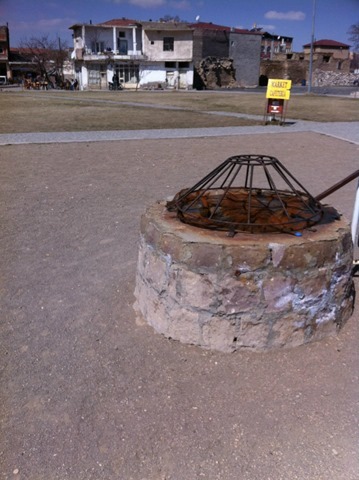 In this way they could remove the stone in large swaths. For smaller areas, they would use smaller tools. 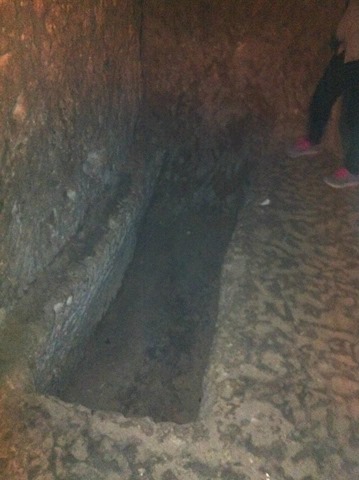 Those who speculate that it was designed to be very temporary need to explain the graves in the area called the Morgue. Here the rooms in this section of the cave are designed to handle the dead… Is it possible these graves were temporary holding places for the dead until they could find peace long enough to bury their dead. Yes, it was very dark 7-8 stories down. The little lights are wired up and brought in through wires attached to the wall. 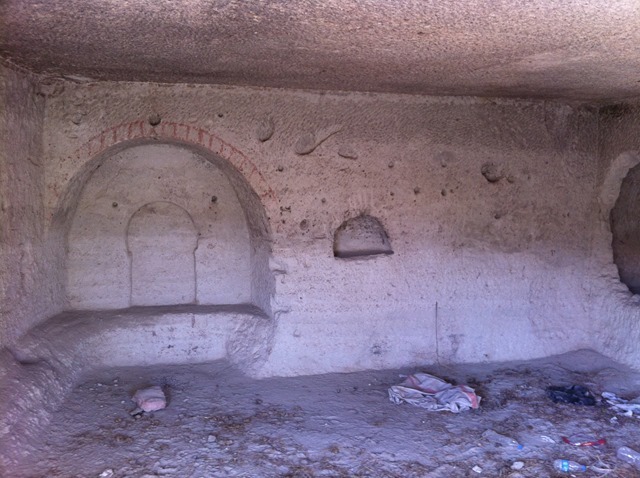 Nevşehir Province has several other underground cities and Derinkuyu itself connects to Kaymakli via an 8 km tunnel. 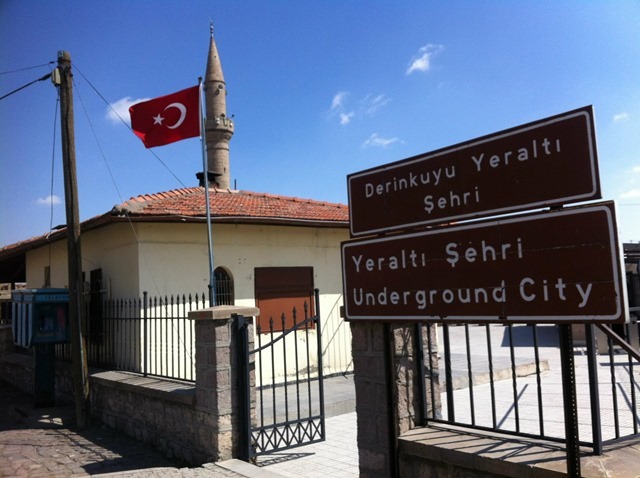 The deepest cave city is Derinkuyu and the widest is Kaymakli. You can’t travel the tunnel between them. 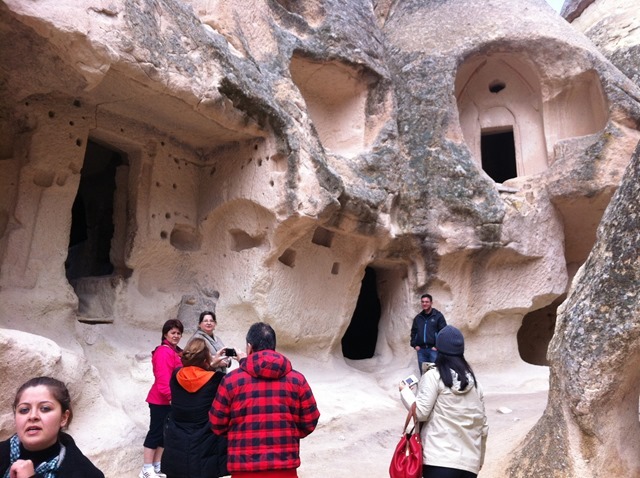 Derinkuyu is about 30 minute drive from Goreme, which is the city where most of the hotel and tourist support is. Access to these cities is no longer open to local residents without going through the main entrance. They remain generally unoccupied. In excess of 200 underground cities containing a minimum of two levels have been discovered in the area between Kayseri and Nevsehir. Some 40 of those contain a minimum of three levels or more. The troglodyte (underground) cities at Kaymaklı and Derinkuyu are two of the best examples of habitable underground structures. Reaching Derinkuyu or Goreme and the underground cities and cave churches, one can purchase a domestic ticket on Turish Airlines to Keyseri or Nevsehir. There are overland bus routes as well from across the country with flying being the shortest and not a bad way to reach the city. Turkey is a big country so plan accordingly. There are so many incredible things to see in Cappadocia that you could spend a weeks here and still discover new places. The main ‘must-see’ attractions are the open-air museums which are essentially groupings of caves, cathedrals and homes and the two best underground cities. 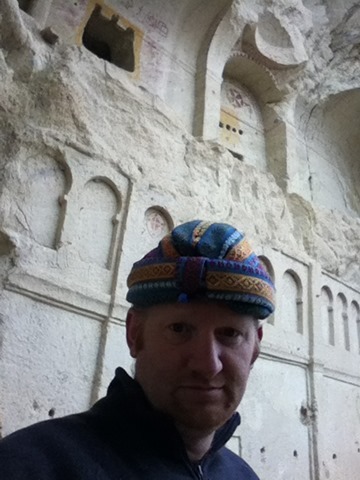 At the same time it wouldn’t make sense to go this whole way and not see the incredible Rose Valley, the Ihlara valley which has many of its own small cave churches, but even just outside the Goreme Open Air museum is one of my favorite cave churches. What you’ll find when you arrive is there are many tourist companies that have organized the tours into the blue route, and red route, and so on, to group the various activities for those with limited time. As well, don’t forget to get up as high as you can to check out the valley, this may be in a hot air balloon or on a hike to the top of the canyons. One thing you must do is explore. There’s so much to see and not everything is behind closed doors. Even just hiking the valleys, you’ll be amazed to find abandoned caves. 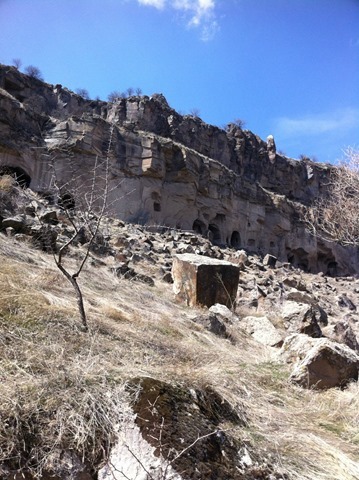 Uchisar: Roman rock-cut castle. You’ll see it driving back and forth. Very cool looking. As a traveler one of the thing that really stands out in digging in to understand a people is how much of culture is influenced by faith and religion. In Europe you must visit the cathedrals because it was the center of the universe for the people. In Istanbul you must visit the Blue Mosque and Hagia Sofia or you haven’t seen Istanbul. I have found Israel, Jerusalem, Bethehem, and Jordan to be quite amazing. Even Cairo had places that reminded me of Moses and the red sea. I have found the cathedrals across Europe to be quite amazing, even Ireland had some amazing history as it relates to early Christianity. Rome and the catacombs. 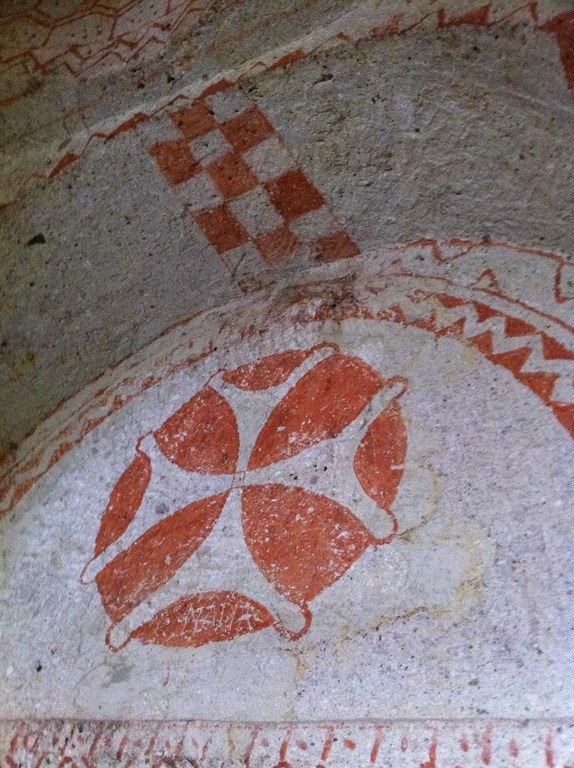 Early Christians in Ireland, or Monserrat in Spain… incredible. These early Christians driven into caves and into the mountains the hermits of Bulgaria and Macedonia are fascinating and must see. The monasteries in the cliffs of Meteora where they survived from decimation for more than 500 years. I love thinking about Thessaloniki or the Thessalonians. My visit to Armenia and connecting with locals and making friends the thoughts and attitudes of the people cannot be separated from their faith as a people. Mount Arrarat and Noah’s Ark and God’s dealing with the Armenian people is so deeply ingrained in their art, their life and spirit. 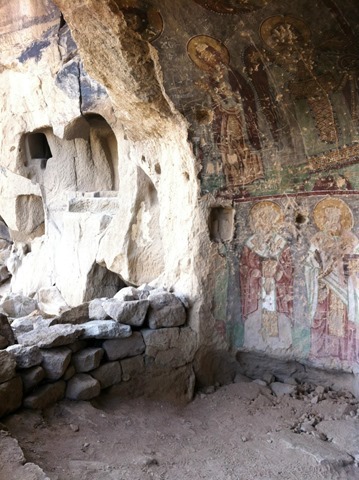 A One trying to understand the mind of the pre-Nicean church can do much study the rich art and paintings captured on the walls of the hundreds if not thousands of painted caves now abandoned art work of Cappadocia. 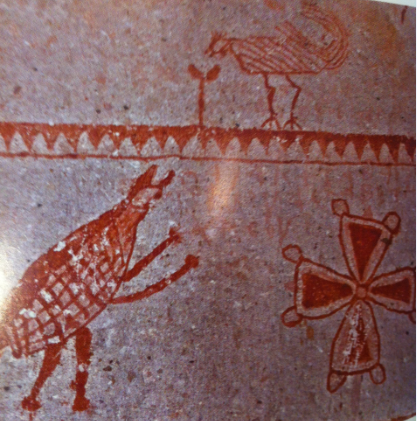 The cave paintings while much has been destroyed have preserved a lot of history and messages through the images. I find it quite inspiring and very peaceful. In some of the churches that you pay to see one with no cameras allowed. 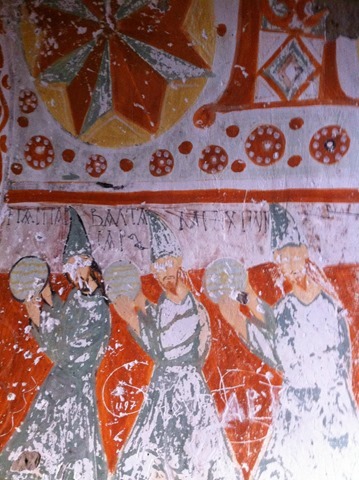 I could easily spend an hour staring at the ceiling and unweaving the thoughts in the heads of these early christians. Their faith, their perspectivies, their stories. Much of the tradition has been preserved, but a lot has been lost as well. Lots of contemplation are required to understand not just the story, but the perceptions of the artist. This photo is not a direct photo, but actually a photo of what I saw, but photographed from a book at the gift shop, or a post card. You can see how much color is still in the images. The color alone is quite the story as the paint was made from pigeon poo. 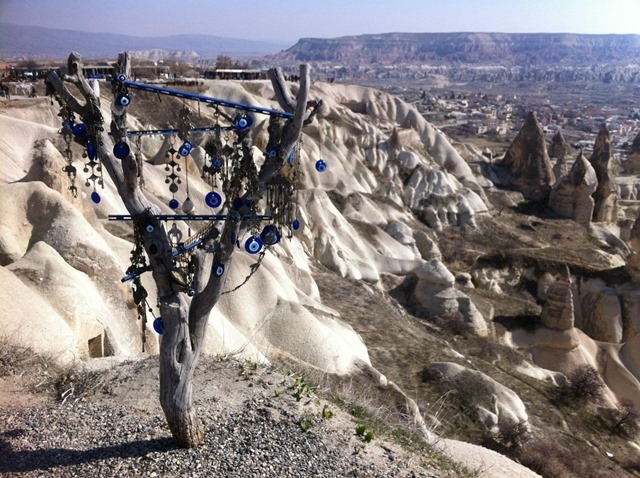 My travels took me to Goreme, in central Turkey. These natural occuring ferry chimneys are amazing. I’ve only been in a few places in the world where they have these, Utah’s Goblin Valley, and Bryce Canyon, but what those places don’t have are the primitive Christian churches and the underground cities. The Tuff left from the volcanic ash turned rock helped provide a substance that was very easy to carve, but also very strong, like a more dense pumice. 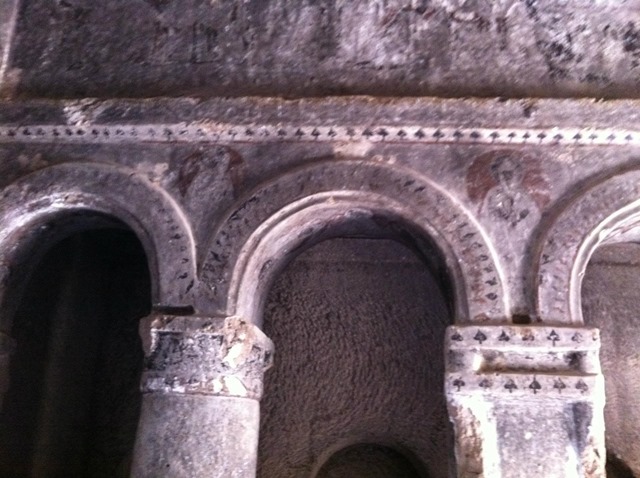 There are multiple locations in Cappadocia where you can find these cave churches. 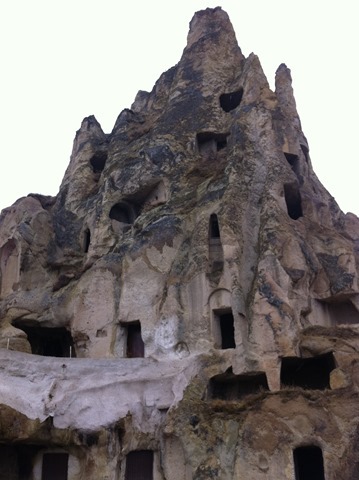 First the largest collection in a small area is the Goreme Open Air Museum. 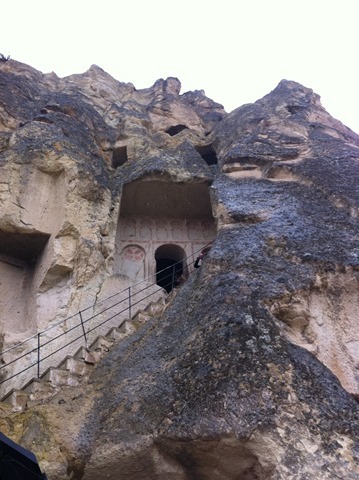 There are lots of great cave hotels in Goreme. I recommend staying in a cave at least one night. It’s a unique experience and it’s quite affordable. Unfortunately nearly all of the churches would not allow photography or video cameras at the Open air musuem. You could take pictures outside, but definitely not as compelling. While these may look impressive, the reality is these were pretty bare. On a walk through the various churches you’d mostly get directed at the various figures and stories from the bible, but it was stories like the animal below that represents paganism that really caught my interest. I was interested in the explanations of what was different and how they lived and what they believed. Like can you believe that most of the well preserved cave paintings have the eyes of the people carved out. I was told the local muslim people felt threatened and the eyes alone could convert. So you have these scary pictures where the eyes are carved out. 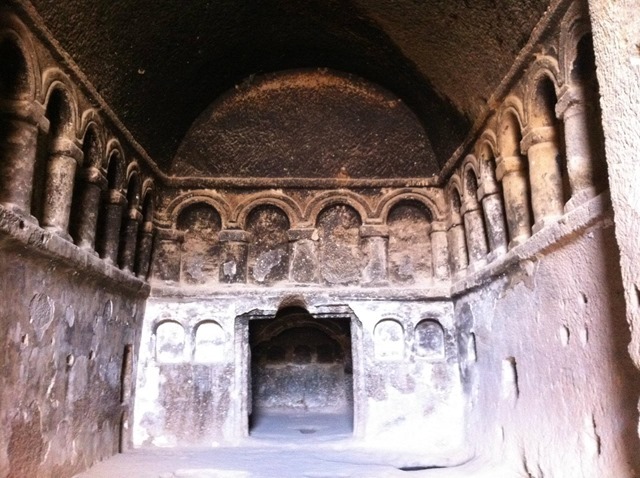 Not only were the churches carved into the stone, the people as well lived in caves in stone where archways could be fancied up. On the left you have the homes of displaced Greeks in Turkey. Most of them moved back to Greece. 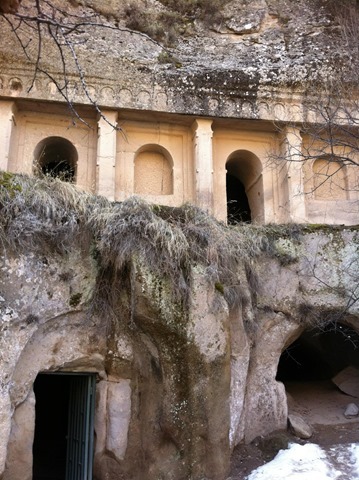 Next we travel to the Ihlara Valley were over a dozen caves were turned into churches. One of the most amazing hikes… Combines peaceful walk along a stream with basalt canyon walls like the snake river valley in Idaho or, and pillars of the Giants Causeway in Ireland. 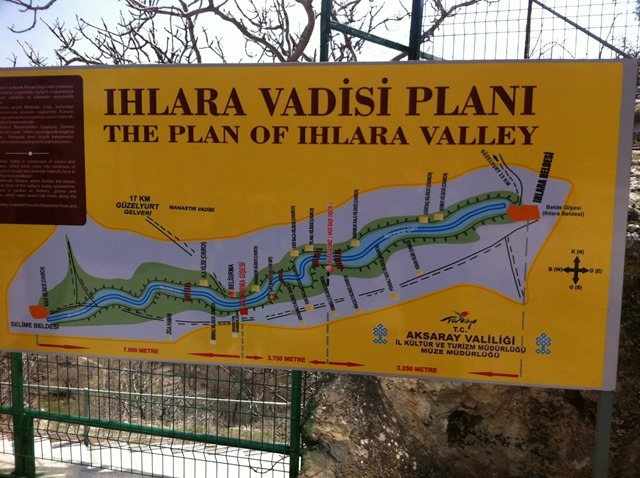 As you can see by the little yellow dots along the slides of the river in the Ihlara valley, for miles along the river, caves were turned into places of worship. If you were simply walking along the river, you would have really No idea this was happening. It’s Fantastic!! Do these caves above look like they might contain this… image to the right. 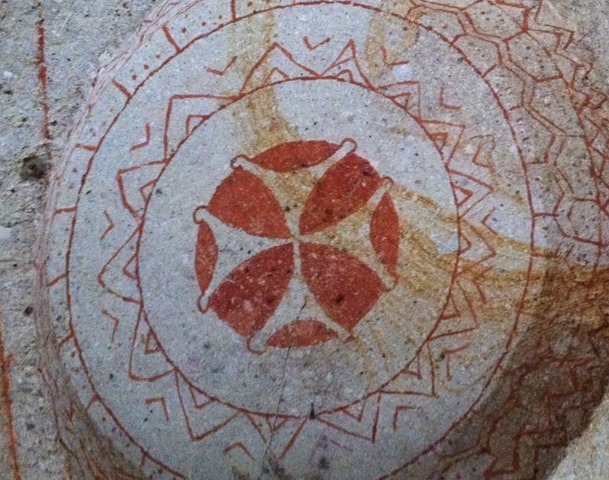 Beautiful art still remains on the walls. Much has been destroyed or defaced. Eyes of the saints in the pictures are scratched out. 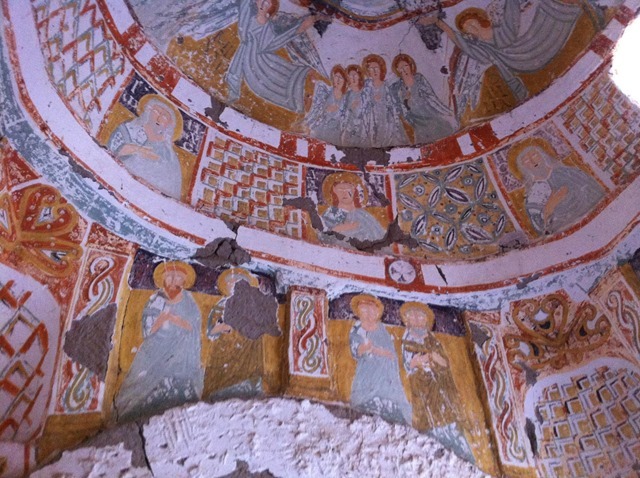 One guide told us that the people were worried about how the beautiful icononic art might convert them. The watching eyes were just too powerful. So much so that for much of what you see there are few eyes you’ll find. 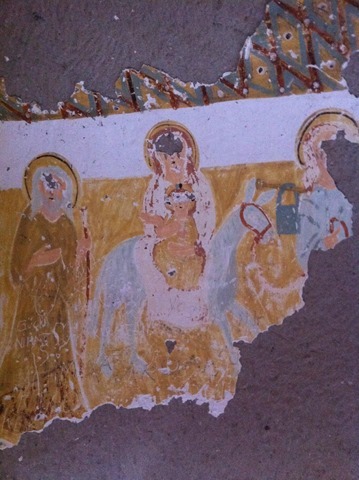 Below the three magi or wisemen and their gifts for the birth of the savior minus their eyes. If you look near the hat you can see names in Greek. It looks like the names of the magi were added afterward. The shape of their hats is interesting. It brings a historical understanding. 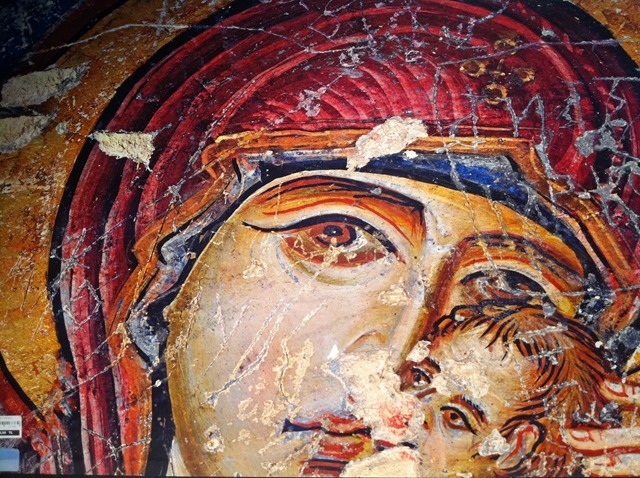 Studying this brings much more understanding of the early 6th century church. Mary on the Donkey… Did you know the reference to Mary riding a donkey is actually not found in the bible, but in apocryphal writings in the text the Infancy Gospel of James? This may be one of the earliest paintings that exists showing Mary on a Donkey. It is very incredible to think of the condition that these paintings were made. 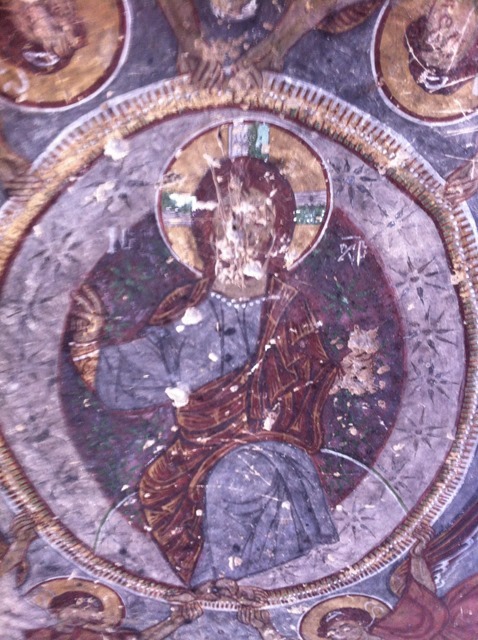 These were painted many many years prior to the crusades, and the spread of the ottoman empire. These were made at time when the Christians were hiding in caves. The paint was made from pigeon droppings. To think about that part of it it’s really very remarkable much remains at all. 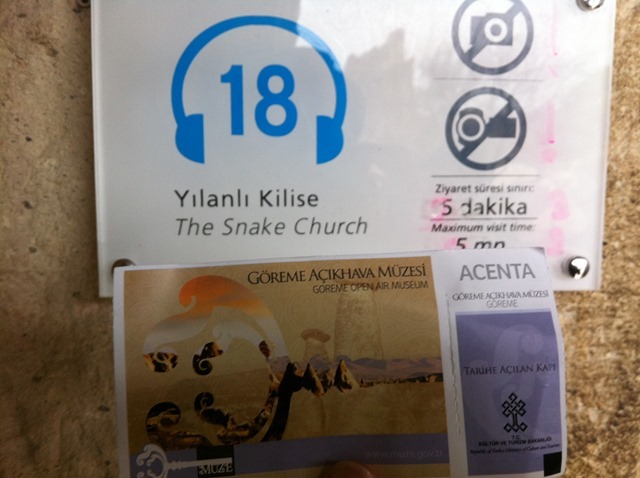 When in Goreme and surrounding you’ll find that you need at least 2 to 3 days to simply race through everything. 4 days to a week will allow you to take a slower pace to really enjoy the valleys and take more in. The tours are very inexpensive, and they are organized into the blue tour, the red tour and so on, and they really are packed with places to see and visit. One morning you need to do the balloon ride for the adventuresome. If you are thinking about the balloon, don’t wait till the last day because they are frequently cancelled due to weather conditions. 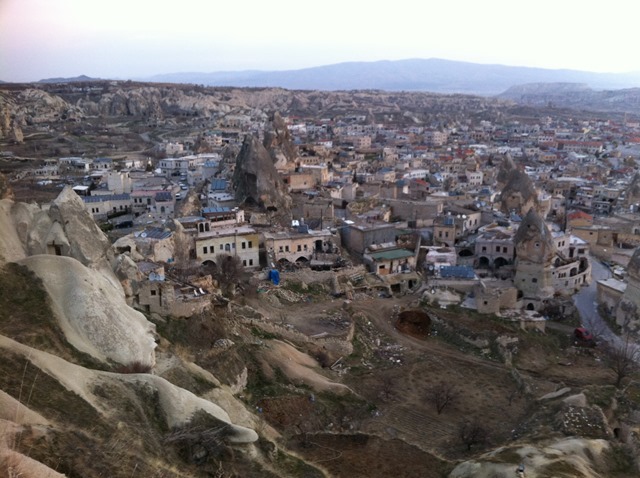 View of Goreme from the top of the hills. 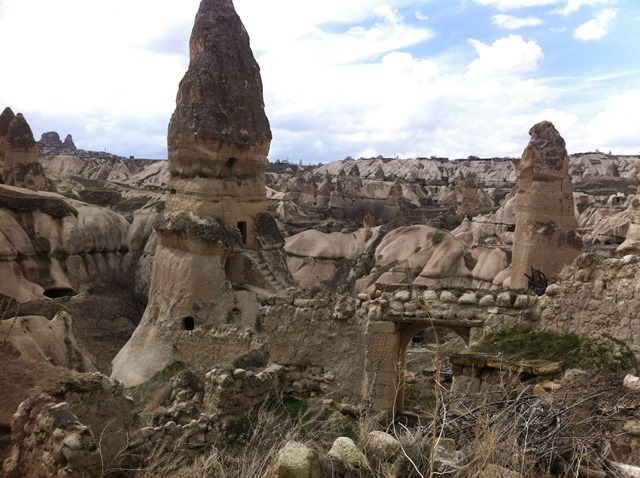 The Fairy chimneys… turned home and now abandoned. A honeycomb of mystery and intrigue. But the payoff is big. 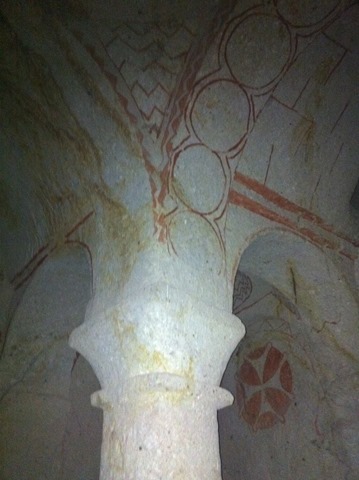 Huge rooms with archways and columns still remain while much of the artwork is destroyed and soot covers the ceilings. If you look closely you can still see remains, of what was once majestic. If there was any doubt that this valley wasn’t backed with mystery, intrigue and wonder… I hope a few of these picture have opened your mind. 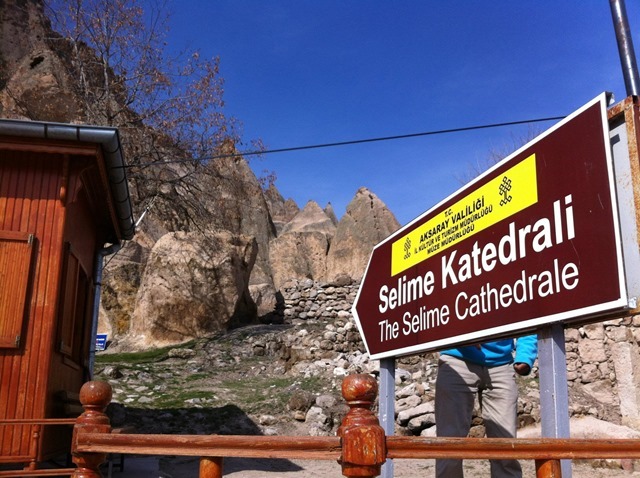 Goreme and Cappadocia still remains one of my favorite destinations and the my appreciation for the early church and their cave dwelling days has shaped what we think of even as a catheral or church. 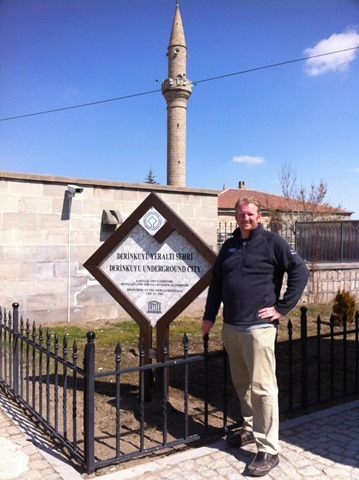 We have much to share in appreciation for these devoted follower of central Turkey. When I first learned about Cappadocia, I was up late watching a late night Sci Fi show on Ancient Alien God theory. 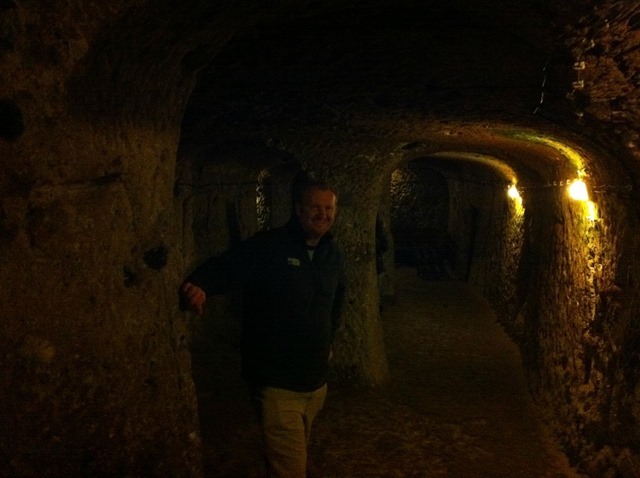 The spokey of underground cities where 20,000 people could live in caves. The spoke cave cities of 13 levels deep and how for thousands of years these caves had lasted time. No one really knows how old these caves are… you can’t carbon date a cave. They think they are at least 1700-2000 years old. 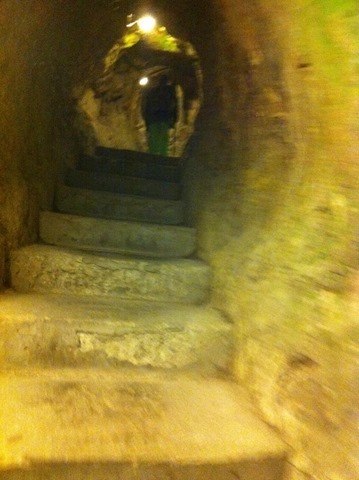 These caves helped save Christianity at a time where it was illegal and the Romans were looking to wipe it out! How do we know? There are hundreds of early 3rd and 4th century cathedrals built by these Christians. They went on to say there are 36 such cities that could support a hundreds of thousands of people…. underground! Some cities are connected by 9 KM tunnels. Only 10% of the caves had even been excavated. What!!? Seems to me like we’d learn more about ourselves and where we came from if we knew more about these caves. Why have I not heard of such an incredible place before? I immediately added it to my list. About 6 months later, when I was planning a trip to Sofia, Bulgaria I remembered these incredible stories and decided… I must go. I priced it out and for less than $200 I could visit this place. You can fly to within an hour of the place. I decided I needed to see how much of this was real. Much to my surprise, these crazy facts were real! I read as much as I could and gasped at the amazing pictures on any image search. I dare you to look. If you’re a world traveller, you’ll immediately add this to your list, and if not it will be a bucket list item. Don’t wait till you’re too old for this one. Remember there’s hiking and walking in caves. You don’t want to hurt your back. How this destination of underground city supports a population larger than most civilizations at the time still boggles my mind. No way. Too incredible. Who wiped out these ancient people? Who were they, what did they believe? Was it an attempt to escape an alien overlord? Doesn’t matter. Despite whether you believe aliens built the multiple thousand year old tunnels or believe it was the Hittites an ancient civilization that’s no longer around, the mystery of these crazy tunnels and underground cities are no less of a wonder. There’s a lot you can read about Derinkuyu, the largest underground city in the world, less than 30 minute drive from Goreme. It’s only been available for tours since 1969. There are plenty of tours that take you on organized tours or you can rent a car and take it at your pace. 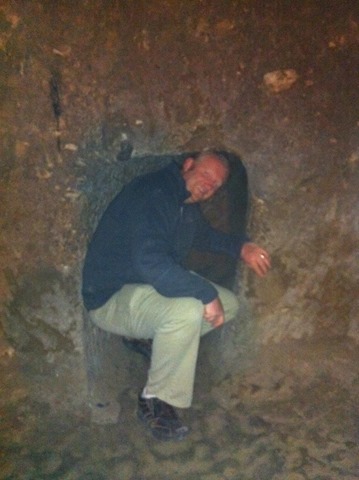 The tunnels are excavated. 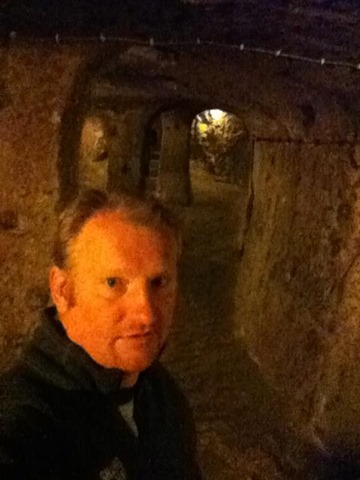 I went 8 levels deep on my tour and there were at least 4 or 5 tunnels that went off into the dark, one such tunnel my guide explained went to the next city. In the underground city you’ll find a winery, church, animal stalls, wells, ancient phone system, ventilation shafts, and a morgue. I visited all of these places on my tour.